The #GuptaLeaks story was driven through an unprecedented collaborative journalism effort. 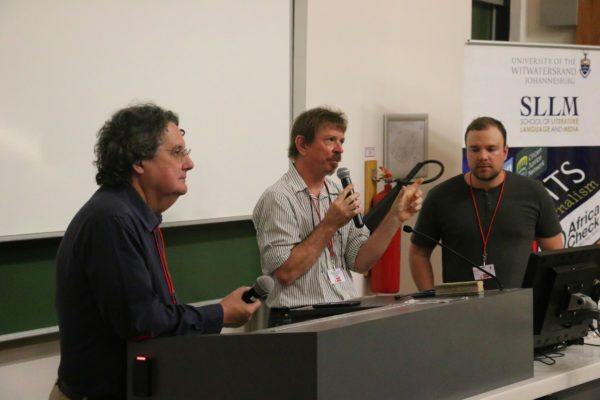 The power of collaborative journalism was emphasised at a discussion about the #GuptaLeaks at the African Investigative Journalism conference (AIJC) on Monday, October 29 at Wits University. Author and freelance journalist, Pieter-Louis Myburgh and managing partner of amaBhungane, Sam Sole, two of 19 journalists who were involved in the story, shared their experience at a session titled ‘#GuptaLeaks and the Power of Cooperation and Competition’. Dubbed the South African story of 2017, #Guptaleaks exposed emails from the controversial Gupta family, associates of former President Jacob Zuma exposing a trail of corruption. Myburgh and Sole explained how they collaborated with competing media houses in cross-media teams, while still managing to compete in uncovering the #GuptaLeaks. “We didn’t want three media houses going after the same story. So, we decided to have a hand shake of dependence and trust,” said Sole. The two journalists partnered with news media organisations such as Media24, amaBhungane and the Daily Maverick because they wanted the storytelling process to establish a network of trust. The team made use of WhatsApp and Dropbox as a means of communication and for the sharing of documents. “The WhatsApp group along with the Dropbox file was something that we started earlier on. These network signals became online spaces that allowed us to analyse data, find story angle approaches and to do agenda setting for the reports” Myburgh said. The ultimate goal of the team was to produce a piece of long-form investigative journalism that is shaped through an ego-less approach. “You can collaborate as much as you can compete when you’re building trust and a network for collaborative journalism, especially when you’re dealing with a massively impactful story for South African media,” Sole said.